The Institute of Jazz Studies (IJS) at Rutgers University-Newark, in New Jersey, has acquired a collection of nearly 1,000 artifacts that belonged to the late William “Count” Basie. The Count Basie Collection, according to an IJS press release, includes the musician’s pianos, Hammond organ, photos, correspondence, concert programs, business records, housewares, and press clippings. “Scholars, curators, writers, students, filmmakers, and music aficionados also will find clothes, accessories, scrapbooks, and audiovisual material from Basie as the collection comes ‘home’ to reside in the Red Bank, N.J., native’s home territory,” the announcement says. Also included in the collection are a Grammy, DownBeataward, and one of Basie’s signature ship captain’s hats. Some of those items were on display at the official announcement of the acquisition yesterday (June 13) at Rutgers’ Newark campus. In addition to hundreds of artifacts, Rutgers-Newark now also retains the rights to Basie’s name, likeness, and trademark. The collection will become available to the public in the near future for research and exhibition. At the announcement event, the New Jersey Performing Arts Center (NJPAC)’s president and CEO, John Schreiber, and the executive director emeritus of IJS, Dan Morgenstern, both spoke about Basie. Newark mayor Ras J. Baraka and Amy Niles, president and chief executive officer of New Jersey jazz radio station WBGO, also made remarks at the announcement. In addition, Joy Rosenthal spoke on behalf of the Basie estate. 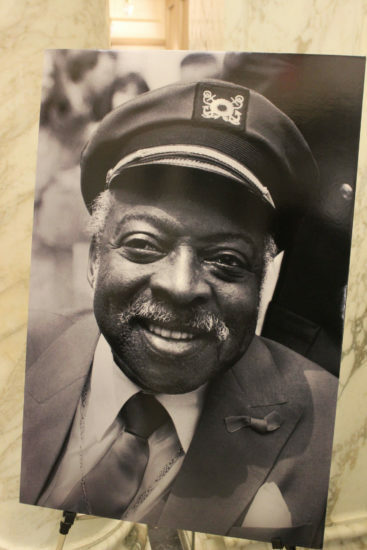 Keyboardist, bandleader, and composer Basie died in 1984 at age 79. During his career, he earned nine Grammy Awards (he was the first African-American to receive a Grammy). Four of his recordings have been inducted into the Grammy Hall of Fame since the late 1970s: “One O’Clock Jump,” “April in Paris,” “Everyday I Have the Blues,” and “Lester Leaps In.” In addition to his music, Basie also received numerous awards and honors from around the world for his humanitarianism and philanthropy.